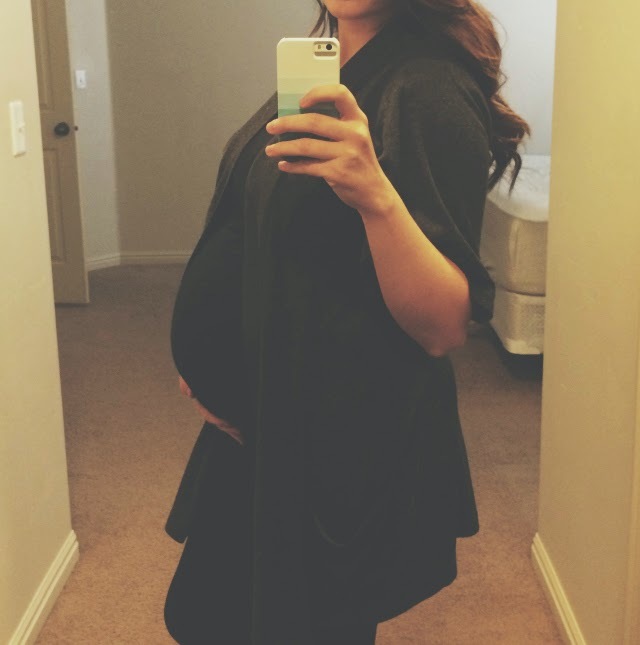 Janelle In Real Life: 38 weeks... chaos ensues. Bad quality & a mirror selfie... but it's all I have. 38 weeks.... how did I get here already? This baby could come any day now, but odds are I'll go over my due date (I was 5 days over with my first, and as of yesterday I haven't started dilating). Total weight gain: almost at the 40 lb. mark. Yeesh. But that's what I gained with my first... it's not that surprising. Maternity clothes: Regular, non tunic shirts are uncomfortably short, so plenty of maternity stuff & the longer non-maternity pieces. Stretch marks: Yes, some of those. But not much more than I already had! Miss anything: having my body back! I'm pretty uncomfortably huge these days and am just ready for the aches & pains to go away. Movement: all the time! And he's definitely running out of room in there. Anything make you queasy or sick: Not too much nausea lately which is real nice. Have you started to show yet: People are starting to be like "wow, you're having that baby any second!" which is sooooo nice of them to say. Labor signs: Some contractions, but obviously nothing indicating true labor since I'm not dilated. I am 50% effaced & the baby is nice and low so those are good signs! Belly button in or out: still in, but barely! Wedding rings on or off: still on, magically. I haven't swollen too much recently which is a great little perk I have going for me. Happy or moody most of the time: Definitely trying to stay on the positive side of things... but it's hard to always be in a great mood when you're so ginormous & uncomfortable. Looking forward to: meeting this little one! Only weeks left! I feel like a lot of this third trimester has been so chaotic, but things are calming down a little more now. We are much closer to having what we need for the new little one! We ended up having to switch our toddler to a real bed last week since he learned how to climb out of his crib, and did so over and over during his nap (and has a gnarly bruise to prove it). It's not ideal timing wise, and we are getting a little less sleep than normal with his newfound independence. He's learned by now though that nap time & bedtime are when he's expected to stay in his bed, so if he does open the door, he just stands in the doorway until I get there and then he runs to jump back in his bed. Overall he's doing pretty good with the transition! We've encountered some financial issues lately that were so hard for me to handle emotionally. Moving definitely cost us and we had less in the bank account than we would have liked to, and on top of that my husband's car has had a lot of issues. It's been overheating like crazy... he's broken down on the side of the freeway 3 times. We've taken it to 4 different mechanics, two of which told us the car was a total loss. The other two thought it could definitely be fixed, and one offered us a reasonable price. Long story short, we've taken it in 3 times, shelled out a big chunk of money, and our car is still where it started... not working. This is an older car and is only worth a few thousand in full working order. Unfortunately, no one can seem to fix the problem so it's doubtful we'll be able to get it working again. We basically flushed our money down the toilet and that is a hard reality to face. I don't tell you this to make you feel bad for us, but rather to explain the miracle of it all. My husband was lucky enough to get a little bonus at the end of the year from his work. We also were generously given some Christmas money from a few family members and in combination with the bonus, we had exactly what we needed to pay for car repairs & moving costs. Financial security is huge for us right now... we're about to be a family of 4! I was losing my mind knowing that we may be scraping by financially right as we're about to have another baby. I know that it's no coincidence that we received exactly what we needed right at the time we needed it. Heavenly Father has been so good to us! I feel incredibly blessed right now, and I'm so grateful to have a husband that knows how to keep a cool head. I've been less than rational at times (you know... hormones and what not) and he's good to have around. We are looking forward to this new little baby because baby snuggles are what make the world go 'round. Wow, first you look absolutely beautiful at 38 weeks! Second, I would be in complete panic/anxiety attack mode. So GO YOU for keeping it all together and knowing that it'll all work out. So happy that your husband got a bonus that helped out with his car and other financials! I will definitely be keeping your family in my prayers! One of my best friends recently had her 2nd child so I know becoming a family of 4 can be overwhelming at times! So happy things are working out for you guys--you totally deserve it! Love keeping up with you through the blog/Instagram!